Royal baby coin. For the first time in its 170-year history, New Zealand Post is issuing a stamp to celebrate a Royal birth. While Royal children have featured on several New Zealand Post stamp issues, there has never before been a commemorative issue to mark a birth. Prince George, along with his proud parents Prince William, the Duke of Cambridge and Catherine, the Duchess of Cambridge, features in a set of photos taken outside the Lindo Wing of St Mary’s Hospital in London a day after the 22 July birth. Pre-orders are available now and the stamps, first day covers and presentation packs will be available through outlets from September 11. 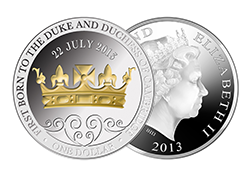 A limited edition 1 oz silver proof coin with selective gold plating will also be issued to mark the Royal birth. It features a coronet design assigned to the Prince, incorporating a stylised koru – a pattern used in Māori art to symbolise new life. “Prince George’s birth was a global event and there was huge excitement in New Zealand about his arrival, so it’s only fitting he gets his own stamp,” says New Zealand Post spokesman, Simon Allison. “The minute news of the Prince’s birth came through, we put into action a plan we’d had in place and worked around the clock to get our commemorative stamp and coin issue finalised,” he said. That process included getting approval for the images and designs from Prince George’s Great Granny – a.k.a. Her Majesty the Queen - along with the Duke and Duchess of Cambridge. “The Queen and the Duke and Duchess have personally okayed the images and we’re glad they agree with our choice of stunning photos which show an immensely proud Royal mum and dad and the baby Prince,” said Simon Allison. The Royal Baby stamp and coin issue will be available from Wednesday 11 September 2013 at PostShops, REAL Aotearoa stores, and online for pre-orders now at www.nzpost.co.nz/royalbaby in a new window. and www.nzcoins.co.nz in a new window. or by phoning 0800 782 677.